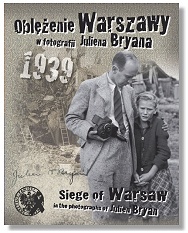 At one o'clock in the morning, on the 7th September 1939, the American photojournalist Julien Bryan arrived by train in the city of Warsaw. It was one week after Nazi Germany had attacked and invaded Poland. Diplomats, the Polish government and foreign correspondents had fled Warsaw two days before. The city was under constant attack from German bombs. Julien Bryan was there to photograph the agony of a city facing the horrors of Hitler's Blitzkrieg. A third of the city was in ruins - destroyed by the hundreds of German bombing raids that had already taken place. On the 10th of September Julien Bryan records how Polish soldiers were flooding back into Warsaw. German forces had almost surrounded the city. As he went through the streets of Warsaw he saw soldiers stopping civilians and getting them to help build barricades to protect the city. The Siege of Warsaw was about to begin. Air raids on Warsaw were now continuous. Julien Bryan spent his time ducking in and out of cellars trying to avoid being killed. The dropped bombs blew huge craters in the city's streets. The artillery fire was even more deadly. No one was safe. The incendiary bombs took fewer lives but left hundreds of thousands of people homeless. Julien Bryan roamed the city at night photographing the burning buildings. The fires lit up the city for miles. By the 15th of September there was a great shortage of food. Long queues formed outside shops in the hope that there would be something to buy. Julien Bryan filmed a church which had been hit by a bomb during Sunday morning mass. He records how the priests attempted to salvage what they could from the ruined church. He came across a hospital which had been hit five times by bombs the day before. He accompanied doctors and nurses as they inspected the damage. Mothers to be had had to take refugee in the cellars during the bombing raids. In the fields outside Warsaw Julien Bryan recalls the most tragic scene that he witnessed. A German plane had machine gunned to death seven women digging for potatoes. As he filmed the aftermath the peasants returned to the field. They risked being machine gunned but if they didn't get the potatoes they would starve to death. Julien Bryan left Warsaw on the 21st of September. A brief truce had been negotiated to allow citizens of neutral countries to leave the city. He smuggled his films out in a suitcase. He went to Königsberg in East Prussia. There he hid his films in the chemical container of a gas mask that a fellow American was taking home. Julien Bryan got the films back six weeks later in New York after he had made his way home via Sweden and Norway. 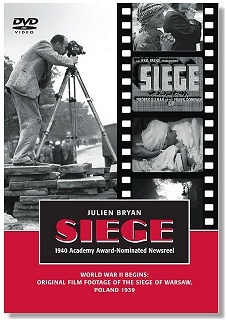 RKO Pictures used some of Julien Bryan's film footage to produce a ten minute newsreel which was shown in American movie theatres early in 1940 as the Siege of Warsaw. Publisher -Distributed by Aquila Polonica in cooperation with the International Film Foundation in 2010. Originally distributed by RKO Pictures in 1940. The running time of the film Siege is 10 minutes. The distributors of Siege are Aquila Polonica. They are a company specialising in the publication of books, in English, about the Polish experience in World War Two. They have published the books Mermaid and the Messerschmitt by Rulka Langer and The Ice Road by Stefan Weydanfeld. Aquila Polonica was founded by Stefan Mucha and Terry Tegnazian. Siege of Warsaw in the Photographs of Julien Bryan, a book edited by Jacek Zygmunt Sawicki and Tomasz Stempowski. Published in Warsaw (2010) by Institute of National Remembrance, 222 pages. Julien Bryan, Holocaust Encyclopaedia, United States Holocaust Memorial Museum. Everyone would believe my pictures - the legacy of Julien Bryan, Holocaust Encyclopedia, United States Holocaust Memorial Museum. This page was added on 02 October 2010. Updated on 28 October 2010.